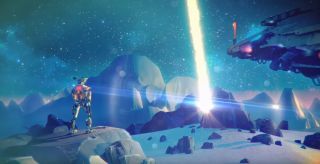 Big Robot—the team behind atmospheric survival-stealth endeavour Sir, You Are Being Hunted—has revealed its latest project: The Signal From Tölva. Billed as a “single-player first-person exploration and combat game”, The Signal From Tölva is set among the ruins of an ancient civilisation—a setting that’s been crafted by hand, unlike the procedurally generated landscapes of its forerunner. You’re also not actually physically present on the planet's surface either, but instead remotely control a humanoid Surveyor drone. “When that chassis inevitably meets a violent end, you’ll simply connect to another,” explains a blog post on the Big Robot site. It continues: “The Signal From Tölva is an open-ended shooter, an action game, and a canvas for exploration. The two big things are: Exploration and Combat. We’ve sunk all our resources into making those two things come alive. The game world is driven by Ai activity that decides where our robots will go, and what they will decide to do." Where stealth was a central tenet of Sir, You Are Being Hunted, The Signal From Tölva encourages a more hands-on approach as it equips players with an arsenal of hi-tech assault rifles, concussion fields, electronic countermeasures, robot-commanding modules, and defensive plasma shields, among other futuristic wares. "Tölva is our ode to classic pulp science fiction, with all its weirdness and drama,” says Big Robot’s Jim Rossignol. “We've long wanted to explore a world of starships floating over hazy valleys, and robots battling amid pulsing ruins. This is that game." The Signal From Tölva is due to launch in early 2017. In the meantime, more information, including story details, can be found this-a-way.